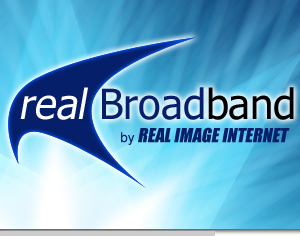 realBroadband is a family of broadband products available exclusively from Real Image Internet. These packages are designed to suit your individual needs. You may combine any realBroadband package with your preferred ADSL connection speed. This allows you to combine the best package to suit your needs. Broadband is the term used for fast Internet access. Think of your dialup connection like a garden hose. Only a certain amount of water can pass through it. Broadband is then more like a fire hose that can bring in the same thing, only much faster. The difference is breadth of the two pipes is called bandwidth. The higher the bandwidth, the faster the data can be transmitted. 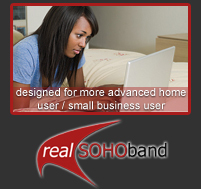 This faster speed allows you to enjoy many more features of the Internet, such as streaming media and radio. 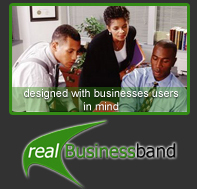 realBroadband is designed to give home, small office/home office and business users instant Internet access 24 hours a day. ADSL - Asymmetric Digital Subscriber Line is the technology used to provide broadband, using a special modem. Asymmetric means that the download speed is different to the upload speed. For example, a 512Kbps/128Kbps connection means you are receiving data up to 512Kbps and outputting data up to 128Kbps. ADSL splits your existing phone line into two channels. - One channel is used to handle voice communication. - The second channel is used for high-speed data connection. What do you get with realBroadband? · Continuous access. ADSL is always on which means no need to dial up every time you want to connect to the Internet. 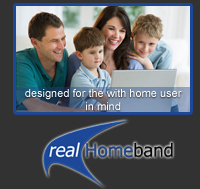 Click the links below to Download the product matrix and more information about the realBroadband family of products. CLICK THE LINK BELOW TO JOIN ! Congratulations, you’re about to become part of the Real Image family - "Swaziland's Leading Internet Service Provider!"